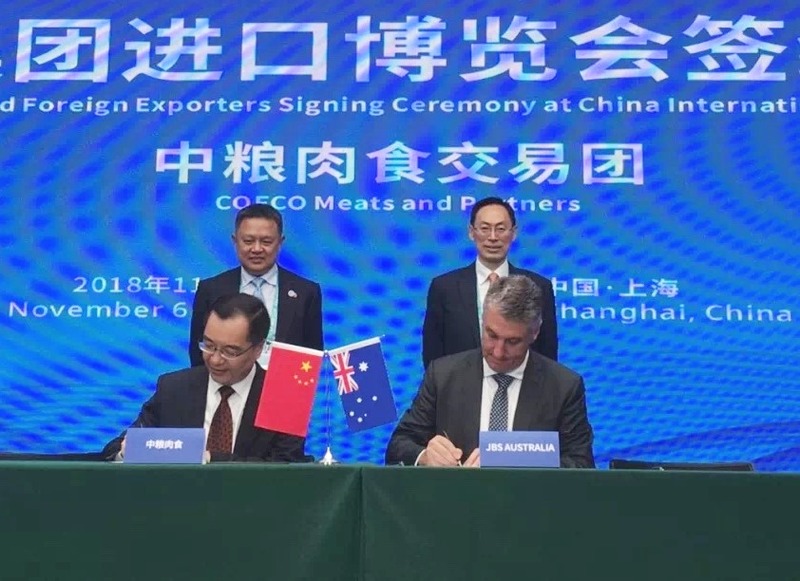 JBS Australia has signed a Memorandum of Understanding with Chinese state-owned meat giant, COFCO Meat Holdings, which could grow into annual trade of 15,000 tonnes of beef worth US$100 million over the next three years. Signed at the recent China International Import Expo in Shanghai, the agreement means JBS and COFCO Meat will continue to grow their business together in coming years, the company said. COFCO is a major meat importer, wholesaler, distributor and further-processor across China. One of the company’s core strengths is in matching customers to the right products across the quality spectrum. JBS Southern beef sales domestic and export manager Robert Ryan said the MoU was an important step in building the customer relationship with the major Chinese business. “COFCO is one of our most important customers in China, and it has developed strong strategic sales channels for the various types of beef we produce in our business,” Mr Ryan said. After working closely with COFCO Meat over the past three years, JBS Australia has increased its beef sales to the company by 270 percent in volume and dollar value by 300 percent, worth about A$37 million in 2018. “We look forward to working closely with COFCO to significantly build on our relationship and continue to provide high quality meat to China,” Mr Ryan said. He said the supply agreement would range from loins and rounds to forequarter meat and offals, both grass and grainfed. Lamb could ultimately be added to the program. During the recent China International Import Expo in Shanghai, JBS Australia chief executive Brent Eastwood met with the COFCO Group president Patrick Yu, as well as the COFCO Meat Holdings managing director Jianong Xu, to discuss the implications behind the MoU for JBS Australia’s exports to China. With the increasing demand for high quality beef and lamb in China, JBS Australia was well placed to supply the high-end market segment, Mr Eastwood said. “The high-end Chinese market requires the ability to deliver safe quality product to the Chinese consumer 52 weeks of the year. JBS, as the largest and most diverse animal protein player in the Australian market, can supply all types of high quality grass and grain-fed branded beef and lamb product to China,” he said. “COFCO has been a valued customer of JBS Australia for many years and part of our discussion surrounded the opening of the Chinese market to ensure the process of exporting to China is easier for companies like JBS Australia, where China is one of the top export destinations. “We are keen to see the improved market access come to life over the coming years,” Mr Eastwood said. The COFCO agreement is the second large meat export deal with Chinese customers announced by JBS divisions this month, after an earlier deal was struck between parent company JBS SA to supply meat out of its South American operations to Chinese online shopping giant, Alibaba. The Alibaba deal (click here to view earlier story) could be worth up to A$2.1 billion in sales over three years, and could ultimately include supply out of Australia.